LG is one of the biggest players in the smartwatch market right now - simply because it keeps making so many of them. It's almost singlehandedly keeping the news on the platform afloat, with multiple models appearing throughout the year. Given smartwatches aren't really a thing people lust after yet, it's odd that the brand is so hell bent on keeping the momentum up. What's even more confusing is that it's decided to create a watch that's not based on the most popular smartwatch platform. You see, the LG Watch Urbane LTE doesn't make any sense - at least outside of Korea. Firstly, it's not running Android Wear but its own wearable platform based on webOS, the OS LG bought up from HP in 2013. This means there are very few apps available of the Watch Urbane LTE, and even those were developed in house, with no news on whether the SDK will be released. Secondly, this is one chunky beast of a watch. To be fair, it's very well made and does feel like a premium device, but that doesn't mean it's needed. The interface is slightly clunky and overbearing (like LG got a bit overexcited with all the things it could push in there) and lacks the slickness of Apple's Watch or even Android Wear. Then there's the LTE and NFC payment mechanisms built right into the device, in part the cause of the heft. The network plans and infrastructure in place to support these things, allowing you to untether from your smartphone and use the watch independently, aren't popular outside of Asia and will be a hard sell in places like the UK. The reason you can probably disregard the LG Watch Urbane LTE as a possible new smartwatch for your wrist is simple: this is a watch made to fulfill a need by LG. Speaking to LG at the press conference, it was clear that the Watch Urbane LTE isn't the big focus for the coming months: "Don't get us wrong, our main strategy is based on Android Wear, not webOS. 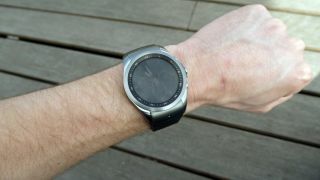 With Android Wear we can't satisfy customers 100%, which is why we've developed [the Watch Urbane LTE], but Android Wear is the primary OS for LG wearable devices," said a spokesperson. "But we have certain technologies to customise our device for our customers [carriers] who want to see something more than Android Wear in the market. We are a company that responds to demand." Would you want to buy a watch that's been developed to fill a need in the market? It makes sense that carriers would want more than Android Wear around, as more competition will stoke the fires of demand and therefore help convince users that smartwatches are a real thing to buy. But LG's stance couldn't be clearer: it's only interested in Android Wear except when it can make a little cash with little side projects. Perhaps the webOS wearable platform will take off. Maybe developers will take to the watch style and begin churning out loads of really great apps for it, making it a real competitor to the Apple Watch. But let's be honest, that's unlikely to ever happen. Even with LG pushing with all its might behind a webOS smartwatch range, it would struggle to make it relevant in the market, so with a stance that says 'well, it's not our main focus, but we did it because we were asked' I wouldn't give it a lot more thought. If the smartwatch does become a viable product category, a lot of the success will lay at the feet of LG - the brand is making some great watches and the Watch Urbane is one of the most stylish Android Wear device out there. The Watch Urbane LTE is a beautiful watch, sure. One that could have had brilliant battery life too. But nowhere near the silver bullet we've been looking for in the wearables market.